An ohmmeter is an electrical instrument that measures electrical resistance, the opposition to an electric current. Micro-ohmmeters (microhmmeter or microohmmeter) make low resistance measurements. Megohmmeters (also a trademarked device Megger) measure large values of resistance. The unit of measurement for resistance is ohms (Ω). 25بك المحتوى هنا ينقصه الاستشهاد بمصادر. يرجى إيراد مصادر موثوق بها. أي معلومات غير موثقة يمكن التشكيك بها وإزالتها. (مارس 2016) مقياس مقاومة أو الاوميتر (بالإنجليزية: Ohmmeter) هو جهاز كهربائي لقياس المقاومة الكهربائية، وحدة قياس المقاومة الكهربائية هي الأوم (Ω). Un ohmmètre est un instrument de mesure qui permet de mesurer la résistance électrique d'un composant ou d'un circuit électrique. L'unité de mesure est l'ohm, noté Ω.
Omomierz – przyrząd służący do pomiaru rezystancji. Do pomiaru rezystancji wykorzystuje się zależności występujące w prawie Ohma, czyli przez pomiar lub ustawienie natężenia prądu płynącego przez badany element i napięcia na badanym elemencie. Omomierz jest jedną z podstawowych funkcji każdego miernika uniwersalnego. Klasyczne układy omomierzy można podzielić na szeregowe i równoległe. Омме́тр (Ом + др.-греч. μετρεω «измеряю») — измерительный прибор непосредственного отсчёта для определения электрических активных (омических) сопротивлений. Обычно измерение производится по постоянному току, однако, в некоторых электронных омметрах возможно использование переменного тока. Разновидности омметров: мегаомметры, гигаомметры, тераомметры, миллиомметры, микроомметры, различающиеся диапазонами измеряемых сопротивлений. Ein Widerstandsmessgerät ist ein Messgerät, mit dem der elektrische Widerstand gemessen wird. Der umgangssprachliche Begriff Ohmmeter ist irreführend aufgrund der gleichnamigen Einheit Ohmmeter. Überdies wird mit Ohm die Maßeinheit bezeichnet und nicht die physikalische Größe, die tatsächlich gemessen wird. Bei Betrieb an Wechselspannung tragen zusätzlich Induktivität und Kapazität des Bauteils einen Wechselstromanteil (Blindwiderstand) zum Widerstand bei. Gleichstrom- und Wechselstromanteil werden zusammengefasst zur Impedanz oder zum komplexen elektrischen Widerstand. Un óhmetro u ohmímetro es un instrumento para medir la resistencia eléctrica. Su diseño se compone de una pequeña batería para aplicar un voltaje a la resistencia de baja medida, para luego, mediante un galvanómetro, medir la corriente que circula a través de la resistencia. El Óhmetro fue inventado por el físico alemán George Simon Alfred Ohm. L'ohmmetro (su alcuni testi è scritto ohmetro)è uno strumento per la misura della resistenza elettrica esistente di un circuito la cui unità di misura è l'ohm (Ω). L'unità di misura possiede questo nome in onore del fisico tedesco Georg Simon Ohm. L'ohmmetro è, insieme all'amperometro, voltmetro, wattmetro, varmetro, cosfimetro (o fasometro), ecc., uno strumento per misurare le grandezze elettriche. Come per altri strumenti, i parametri fondamentali di un ohmmetro sono tre (vedi Strumenti di misura per grandezze elettriche): Un altro parametro non meno importante è la tensione di isolamento. Een ohmmeter is een meetinstrument om de elektrische weerstand van een bepaalde stof of van een elektrische component te meten. Dit gebeurt door een elektrische spanning aan te brengen over de te meten component en de resulterende elektrische stroom te meten. Via de wet van Ohm kan dan de elektrische weerstand worden berekend. Deze berekening is al op de meetschaal verwerkt, waardoor de weerstandswaarde rechtstreeks in ohm (Ω) kan worden afgelezen. Met een Brug van Wheatstone en diverse verfijningen daarvan kunnen weerstanden ook gemeten worden. An ohmmeter is an electrical instrument that measures electrical resistance, the opposition to an electric current. Micro-ohmmeters (microhmmeter or microohmmeter) make low resistance measurements. Megohmmeters (also a trademarked device Megger) measure large values of resistance. The unit of measurement for resistance is ohms (Ω). The first ohmmeters were based on a type of meter movement known as a 'ratiometer'. These were similar to the galvanometer type movement encountered in later instruments, but instead of hairsprings to supply a restoring force they used conducting 'ligaments' instead. These provided no net rotational force to the movement. Also, the movement was wound with two coils. One was connected via a series resistor to the battery supply. The second was connected to the same battery supply via a second resistor and the resistor under test. The indication on the meter was proportional to the ratio of the currents through the two coils. This ratio was determined by the magnitude of the resistor under test. The advantages of this arrangement were twofold. First, the indication of the resistance was completely independent of the battery voltage (as long as it actually produced some voltage) and no zero adjustment was required. Second, although the resistance scale was non linear, the scale remained correct over the full deflection range. By interchanging the two coils a second range was provided. This scale was reversed compared to the first. A feature of this type of instrument was that it would continue to indicate a random resistance value once the test leads were disconnected (the action of which disconnected the battery from the movement). 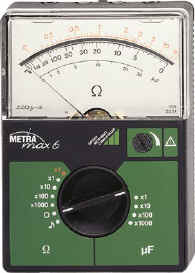 Ohmmeters of this type only ever measured resistance as they could not easily be incorporated into a multimeter design. Insulation testers that relied on a hand cranked generator operated on the same principle. This ensured that the indication was wholly independent of the voltage actually produced. Subsequent designs of ohmmeter provided a small battery to apply a voltage to a resistance via a galvanometer to measure the current through the resistance. The scale of the galvanometer was marked in ohms, because the fixed voltage from the battery assured that as resistance is decreased, the current through the meter would increase. Ohmmeters form circuits by themselves, therefore they cannot be used within an assembled circuit. This design is much simpler and cheaper than the former design, and was simple to integrate into a multimeter design and consequently was by far the most common form of analogue ohmmeter. This type of ohmmeter suffers two inherent disadvantages. First, the meter needs to be zeroed by shorting the measurement points together and performing an adjustment for zero ohms indication prior to each measurement. This is because as the battery voltage decreases with age, the series resistance in the meter needs to be reduced to maintain the zero indication at full deflection. Second, and consequent on the first, the actual deflection for any given resistor under test changes as the internal resistance is altered. It remains correct at the centre of the scale only, which is why such ohmmeter designs always quote the accuracy "at centre scale only". A more accurate type of ohmmeter has an electronic circuit that passes a constant current (I) through the resistance, and another circuit that measures the voltage (V) across the resistance. According to the following equation, derived from Ohm's Law, the value of the resistance (R) is given by: For high-precision measurements of very small resistances, the above types of meter are inadequate. This is because the meter's reading is the sum of the resistance of the measuring leads, the contact resistances and the resistance being measured. To reduce this effect, a precision ohmmeter has four terminals, called Kelvin contacts. Two terminals carry the current from the meter, while the other two allow the meter to measure the voltage across the resistor. With this type of meter, any voltage drop due to the resistance of the first pair of leads and their contact resistances is ignored by the meter. This four terminal measurement technique is called Kelvin sensing, after William Thomson, Lord Kelvin, who invented the Kelvin bridge in 1861 to measure very low resistances. The Four-terminal sensing method can also be utilized to conduct accurate measurements of low resistances. Ein Widerstandsmessgerät ist ein Messgerät, mit dem der elektrische Widerstand gemessen wird. Der umgangssprachliche Begriff Ohmmeter ist irreführend aufgrund der gleichnamigen Einheit Ohmmeter. Überdies wird mit Ohm die Maßeinheit bezeichnet und nicht die physikalische Größe, die tatsächlich gemessen wird. Der Widerstand eines elektrisch leitenden Bauteils bei Gleichspannung resultiert im Wesentlichen aus dessen geometrischer Form und einer Materialeigenschaft (spezifischer elektrischer Widerstand) und führt zum ohmschen Widerstand oder Gleichstromwiderstand, fallweise auch zu einem differenziellen Widerstand. Bei Betrieb an Wechselspannung tragen zusätzlich Induktivität und Kapazität des Bauteils einen Wechselstromanteil (Blindwiderstand) zum Widerstand bei. Gleichstrom- und Wechselstromanteil werden zusammengefasst zur Impedanz oder zum komplexen elektrischen Widerstand. Ein Widerstandsmessgerät ist üblicherweise ausgelegt zur Messung des ohmschen Widerstands, zum Beispiel eines unbekannten Bauteiles oder eines elektrischen Verbrauchers. Vereinfachte Geräte zum Erkennen einer elektrischen Verbindung werden als Durchgangsprüfer bezeichnet. Auf Geräte für weiterführende Widerstands-Messaufgaben wird unten verwiesen. Un óhmetro u ohmímetro es un instrumento para medir la resistencia eléctrica. Su diseño se compone de una pequeña batería para aplicar un voltaje a la resistencia de baja medida, para luego, mediante un galvanómetro, medir la corriente que circula a través de la resistencia. La escala del galvanómetro que está calibrada directamente en ohmios, ya que en aplicación de la ley de Ohm, al ser el voltaje de la batería fijo, la intensidad circulante a través del galvanómetro sólo va a depender del valor de la resistencia bajo medida, esto es, a menor resistencia mayor intensidad de corriente y viceversa. Existen también otros tipos de óhmetros más exactos y sofisticados, en los que la batería ha sido sustituida por un circuito que genera una corriente de intensidad constante I, la cual se hace circular a través de la resistencia R bajo prueba. Luego, mediante otro circuito se mide el voltaje V en los extremos de la resistencia. De acuerdo con la ley de Ohm el valor de R vendrá dado por: Para medidas de alta precisión la disposición indicada anteriormente no es apropiada, por cuanto que la lectura del medidor es la suma de la resistencia de los cables de medida y la de la resistencia bajo prueba.Para evitar este inconveniente, un óhmetro de precisión tiene cuatro terminales, denominados contactos Kelvin. Dos terminales llevan la corriente constante desde el medidor a la resistencia, mientras que los otros dos permiten la medida del voltaje directamente entre terminales de la misma, con lo que la caída de tensión en los conductores que aplican dicha corriente constante a la resistencia bajo prueba no afecta a la exactitud de la medida. El Óhmetro fue inventado por el físico alemán George Simon Alfred Ohm. Een ohmmeter is een meetinstrument om de elektrische weerstand van een bepaalde stof of van een elektrische component te meten. Dit gebeurt door een elektrische spanning aan te brengen over de te meten component en de resulterende elektrische stroom te meten. Via de wet van Ohm kan dan de elektrische weerstand worden berekend. Deze berekening is al op de meetschaal verwerkt, waardoor de weerstandswaarde rechtstreeks in ohm (Ω) kan worden afgelezen. Voor metingen in het bereik van enkele ohms tot enkele honderden kΩ geldt dat een ohmmeter als los meetinstrument zelden of nooit als zodanig gemaakt wordt, maar vrijwel altijd beschikbaar is als meeteenheid van een multimeter. Met een Brug van Wheatstone en diverse verfijningen daarvan kunnen weerstanden ook gemeten worden. Um Ohmímetro é um instrumento de medida elétrica que mede a resistência elétrica. Ou seja, a oposição à passagem da corrente elétrica. O modelo original de um ohmímetro provinha de uma pequena bateria que aplica uma tensão à resistência. É usado um galvanômetro para medir a corrente elétrica através da resistência. A escala do galvanômetro era marcada em ohms, porque a tensão fixa da bateria garantia que, conforme a resistência diminuísse, a corrente através do medidor aumentaria. Um tipo de ohmímetro mais preciso possui um circuito eletrônico que fornece uma corrente constante I através da resistência, e outro circuito mede a tensão V (o V é usado pela física, mas os técnicos em eletrônica usam "E" ou "U") sobre a resistência. De acordo com a seguinte equação, derivada da Lei de Ohm, o valor de resistência é dada por: R= Resistência V(U)= Diferença de potencial I= Intensidade da corrente Para medições de alta precisão, os ohmímetros citados acima são inadequados. Isto é devido ao medidor ler a soma das resistências do fio condutor da resistência sendo medida. Para reduzir este efeito, um ohmímetro de precisão tem quatro terminais, chamados contatos de Kelvin. Dois terminais transportam a corrente do medidor, enquanto os outros dois permitem medir a tensão diretamente sobre o resistor. Assim, qualquer queda de tensão através da resistência do primeiro par de fios é ignorada por esse tipo de medidor.